by Victor Manganaro | Aug 16, 2017 | Diversity, Equipment Leasing & Financing, IT Integrated Procurement, STEM diversity, Software Audits, Software Licensing Optimization, Strategic Sourcing, Supply Chain Diversity, Tail Spend Management, Uncategorized | no comments. 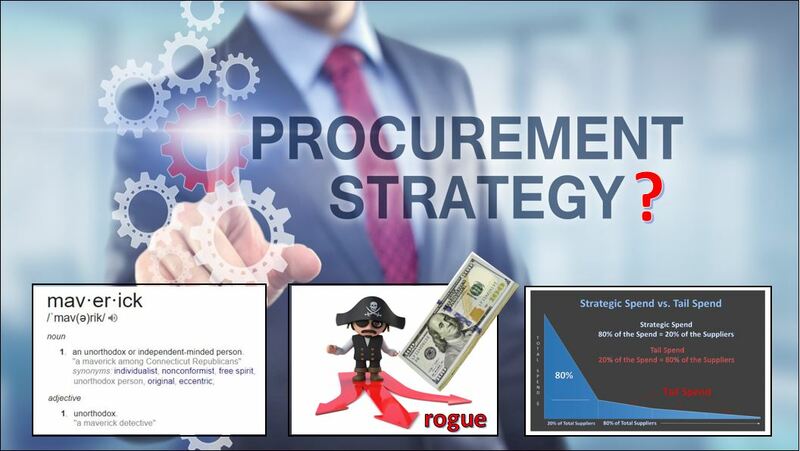 Maverick Spend, Rogue Spending and Tail Spend are common terms in procurement. As an adjective, rogue can be defined as unpredictable. Maverick can be defined as unorthodox or independent. Well, Tail, we’ll explain that in a minute. Clearly, when talking about your procurement spend processes and procedures, these are not descriptors that will instill confidence. The three terms are interchangeably used to represent any spend done by corporate personnel outside the managed structure and guidelines set by procurement. Therefore, this spend is considered un-managed. As Shakespeare said “A rose by any other name would still smell sweet”. In this case not so sweet. Un-managed spend is bad for your organization. It wastes money and increases risks associated with non-compliance. What’s probably an even greater critical issue for your company, un-managed spend prevents the necessary visibility into a key part of the corporate spend thereby making planning and forecasting complicated, incomplete or inaccurate. Un-managed spend significantly reduces the value of a Procurement organization. This is confirmed by an overwhelming majority of procurement executives in a recent survey. In fact 80% considered the percentage of managed spend as the top metric in measuring procurement’s value. How does Spend go un-managed and snowball into the problem that it is? Smaller purchases tend to be less controlled as it can vary by department, division or even employee. They have some autonomy and leeway to make these kinds of low-value purchases. Often times they are left to their own system and judgement when no process has been put in place. Using their own personal brand of negotiating may appear to be getting the company a good deal, and initially, it may. Until, for instance, it is revealed that the purchase and its associated contract overlapped an existing corporate contract, causing a threshold miss of a larger volume discount as well as putting the company at greater compliance risk. Additionally, if the existing processes are cumbersome or broken, employees will improvise and do what it takes to get the job done. Especially if purchasing is not their primary function. Unfortunately, this jeopardizes compliance and cost savings because they don’t have the training or experience of the procurement professionals who take best practices into account. Management concedes a percentage of spend will be un-managed, not realizing that it’s not a static percentage, it grows! Why is it called “Tail” spend and how is it bad? Ok, here’s a good place to talk about “Tail” Spend. Well, it’s based on the Pareto curve or 80/20 rule. The rule, applied to Procurement, says that 80% of the Total Spend is made with 20% of the vendors. Therefore, the remaining 20% of the spend, which consists of high-volume low-value transactions, uses 80% of the vendors. That 80% represents a great number of transactions by a large number of vendors, thus creating a long unmanageable tail that keeps growing. If you would like to view the graph, click here (but I would wait until you get through the rest of the article, and I’ll include the link there too). What are the consequences of un-managed spend getting out of control? Without full visibility, how do you begin to move un-managed spend into managed categories? Well, you have to start somewhere. Begin by identifying the areas where lower value transactions are typically made. That can either be by category or by monetary threshold. This is a key first step towards greater visibility and ultimately implementing a fully automated and comprehensive spend tracking and analysis system. Determine a threshold based on existing procurement data. All purchases below the threshold must be secured through the use of a Purchase Card or P-Card. Purchases can then be tracked and trends identified for future planning. Also p-cards eliminate the need for purchases orders on lower value purchases, thereby reducing the burden on procurement while still providing visibility. Set up an e-catalog system where most lower value purchases can be found in an online catalog with preferred suppliers. Over time, one-off purchases can be identified and added to the catalog thereby moving items from un-managed to managed. Having access to all contracts in the company is important to managing spend. Why? With so many vendors not under the ‘managed’ umbrella, comes a whole lot of contracts whose terms may overlap or conflict with other divisional or company-wide ones. This will put your company’s compliance at greater risk and cause you to miss out on volume discounts. This is why a central contract repository is so critical. With all the contracts in one place and monitored, flags can be set up to identify overlapping or conflicting terms. Additionally, alerts for contracts close to their terms-end allow for necessary re-negotiation time or a new source bid auction. Why is Stakeholder buy-In & corporate adoption so critical? Efforts at gaining more control of your company’s spend cannot work if there is no top-to-bottom buy-in. The corporate executives must be fully committed to driving the change message. Experienced procurement professionals must lead the development of best practices regarding policies, processes and procedures. Employees, who are used to doing things one way, will resist if these new policies, processes and procedures are too cumbersome or not clearly laid out. Management must understand that needs need to be met. In many cases, employees have a job to do and are simply doing it in a way that allows them to fulfill their job obligations. They have good intentions but don’t see the bigger picture. For instance, if a manager in the sales department is downloading a software for her sales agents, then that would indicate that there’s an issue that needs to be fixed. Instead of focusing on the fact that the manager downloaded software without consulting Procurement, it might be a better idea to focus on the need she was trying to fill. Going through the exercise of identifying and resolving unmanaged spend is actually great for a company — it is like taking inventory or a doing spring-cleaning. It reveals areas in the organization that could benefit from improvements. Looking at it from this perspective provides positive motivation for all involved. Since most people don’t like change, if approached as a way to help streamline and improve processes, the initiative would be more welcomed. Employees will respond favorably to removing tedium and saving time. Why is Spend Tracking and Analysis so important? Ultimately a spend tracking and analysis tool becomes a necessity. The supply chain is undergoing a major transformation with the rapid increase of use of robotics and 3D printing. New supply chain data points are being added daily. The more visible and real-time your data is, the better your company can adapt and plan effectively, saving a lot of money. Having the ability to get a view by any factor— such as category, vendor, purchase threshold, or any other important metrics, provides insights into what the company is doing right and also what it could do better. Setting up automatic KPIs to rate performance allows customization based on the industry, size and type of business. The global supply chain is dynamic and requires constant adaptation. Though some immediate benefits can be realized, full implementation, identification and analysis is going to take time. Analyzing your corporate spend will require a year’s worth of data. Certainly extrapolation is an option using 3 months and 6 months of data, but that snapshot of four quarters will really provide insights that will best your competitors who have not taken the vital steps. The quicker you start the process of implementing an analysis tool, the closer your organization is to full visibility of its spend! Regardless of the name given to un-managed spend — Rogue, Maverick or Tail —it still leads to the same results — wasted money and greater risks of non-compliance. Not-to-mention a huge blind-spot in the visibility of all areas of corporate spend. Smaller purchases add up and without the proper processes and procedures, money will continue to be wasted, to the tune of millions of dollars! Too many vendors and in many cases those who do not meet performance parameters, will mean many more contracts which most likely will conflict or overlap. This will drain resources, as stated by Forrester earlier, in resolving related issues. Buy-in from all stakeholders with clear guidelines is essential for any new process to work. Having a spring cleaning mentality will allow the process to be accepted and flow more smoothly. Think how everyone feels after Spring Cleaning is done – it may not be enjoyable while you’re in the middle of it, but it sure feels wonderful at the end. Ultimately, in order to stay competitive in a very fast-changing environment, a comprehensive Spend Tracking and Analysis tool must be implemented. Providing full visibility into corporate spend is critical to planning effectively. Having the ability to program industry-related algorithms and unique business-specific KPIs, as well as using predictive modeling will allow for accurate forecasting and prevent money from going down the drain. Full on-demand reporting will reduce those stressful man-power exercises of report generation through spreadsheet filtering. Finally, whatever you decide to call your un-managed spend —Maverick, Rogue or Tail, you can become a super-hero by taking the steps towards increasing the value of your Procurement organization. For graphs and more in-depth information on Tail Spend, click here. Also, check out the short video on Tail Spend as part of the webisode series called Ask Avis, Procurement solutions in 90 seconds. If you have any questions about anything discussed in this primer, please use this link to get them answered.